Santa Margherita Ligure is a comune (municipality) in the Metropolitan City of Genoa in the Italian region Liguria, located about 35km southeast of Genoa, in the Tigullio traditional area.Santa Margherita Ligure borders the following municipalities: Camogli, Portofino, Rapallo.It has a port, used for both tourism and fishing activities. Visit Abbazia di San Fruttuoso and Santuario di Montallegro for their historical value. Visiting Baia del Silenzio and Bagni Marina Stabilimento Balneare will get you outdoors. And it doesn't end there: stroll through Bagni Marini, trek along Camogli - San Rocco - Batterie - San Fruttuoso Trail, kick back and relax at San Michele di Pagana, and look for all kinds of wild species at Park of Portofino. For traveler tips, photos, ratings, and more tourist information, use the Santa Margherita Ligure travel guide. Use the Route module to find suitable travel options from Uppsala, Sweden to Santa Margherita Ligure. 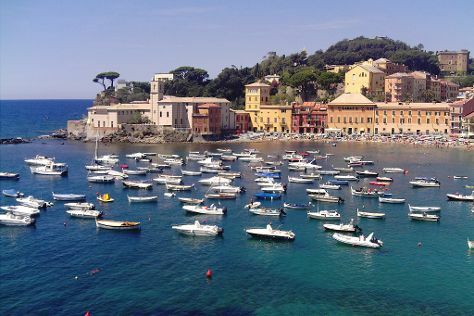 In August, Santa Margherita Ligure is a bit warmer than Uppsala - with highs of 32°C and lows of 25°C. 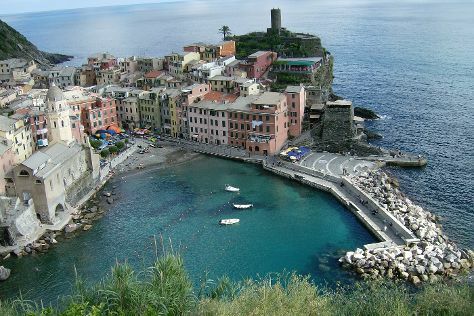 Cap off your sightseeing on the 15th (Mon) early enough to travel to Cinque Terre. Take a break from the city and head to Cinque Terre Trails and Beach Bar Stella Marina. Get some historical perspective at Via Garibaldi and San Pietro Church. Explore Cinque Terre's surroundings by going to Portovenere (in Porto Venere), Monterosso al Mare (Spiaggia di Fegina & Convento dei Cappuccini e Chiesa di San Francesco), Genoa (Boccadasse & Bagni Aldebaran), Biking Trails Levanto - Framura (in Levanto) and Riomaggiore (Trail 2 & Trail 531 Riomaggiore to Manarola). Spend the 17th (Wed) exploring nature at Parco Nazionale Cinque Terre. Next up on the itinerary: hike along Footpath Monterosso - Vernazza, don't miss a visit to Oratorio della Confraternita dei Neri Mortis et Orationis, take in the spiritual surroundings of Church of San Giovanni Battista, and explore and take pictures at Vernazza. For photos, traveler tips, and other tourist information, use the Cinque Terre travel guide. Explore your travel options from Santa Margherita Ligure to Cinque Terre with the Route module. In August in Cinque Terre, expect temperatures between 33°C during the day and 22°C at night. Finish your sightseeing early on the 21st (Sun) so you can travel to Finale Ligure. Finale Ligure is a comune on the Gulf of Genoa in the Province of Savona in Liguria, Italy. Relax by the water at Bagni Wanda and Il Cavallino Bianco Beach. Take a break from the city and head to Bagni Regina and Varigotti Beach. Change things up with these side-trips from Finale Ligure: Bagni Marechiaro (in Cogoleto), Budello di Alassio (in Alassio) and Lungomare Europa - pista ciclabile fra Varazze e Cogoleto (in Varazze). It doesn't end there: enjoy the sand and surf at Baia dei Saraceni and Head underground at Grotte di Toirano. To see more things to do, photos, maps, and other tourist information, use the Finale Ligure travel guide. Use the Route module to find suitable travel options from Cinque Terre to Finale Ligure. In August, daytime highs in Finale Ligure are 33°C, while nighttime lows are 21°C. Cap off your sightseeing on the 24th (Wed) early enough to travel back home.